Riccarton Bush, nestled in the central suburb of Fendalton, is a not-so-secret gem well worth exploring. Stroll among 600 year old Kahikatea trees, feed the ducks, and have a play or picnic in the beautiful grounds of Riccarton House. Check out Deans Cottage, a colonial dwelling built in 1843 – it’s the oldest building on the Canterbury Plains. 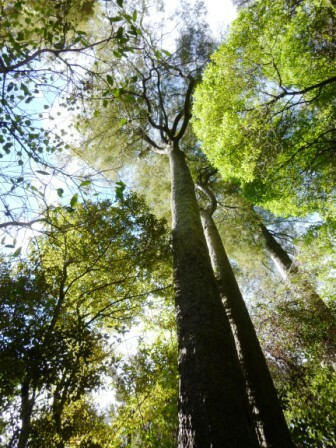 Do the Kahikatea Loop Track and marvel at the ancient kahikatea, totara, matai and hinau in this podocarp forest. Explore the surrounds of Riccarton House: there are lots of luscious green areas for picnics and play; some of the older trees around the house are numbered – make a game out of finding the numbers; in autumn, have a good run through the leaves; check out the raised garden beds behind Riccarton House. Take a tour of Riccarton House or visit the restaurant. There’s a popular Farmers’ Market every Saturday from 9 am to 1 pm. The tracks are easy to navigate – your main option is the Kahikatea Loop, which was less than 1 km and took us about half an hour (with a stop or two). The paths are perfect for buggies, strollers, and little legs. There are lots of rest stops and information boards along the way. Riccarton Bush is located at 16 Kahu Road, Riccarton. It has a good sized off-street car park. Will check out some of these place when next in Chch at Xmas. Great work! Hi Rachael – perhaps I can double the content by Christmas!